The Esposito Lab has provided 2 kits for both Ras wild type and mutant constructs. The RAS Pathway 2.0 Clone Collection is a set of vectors for use with the Gateway® Cloning Platform (Life Technologies) to permit construction of RAS pathway gene expression vectors for in vitro and in vivo research. While these clones can be used for standard Gateway cloning, their utility is greatly enhanced with the use of the FNLCR Combinatorial Cloning Platform (CCP) which allows simplified construction of vectors with different elements (see Wall VE et al, 2014 for more information). This collection contains 61 wild type and mutant RAS genes as Gateway entry clones. It is comprised of wild type HRAS, NRAS, KRAS4a and KRAS4b gene plasmids as well as different mutant versions of each gene. 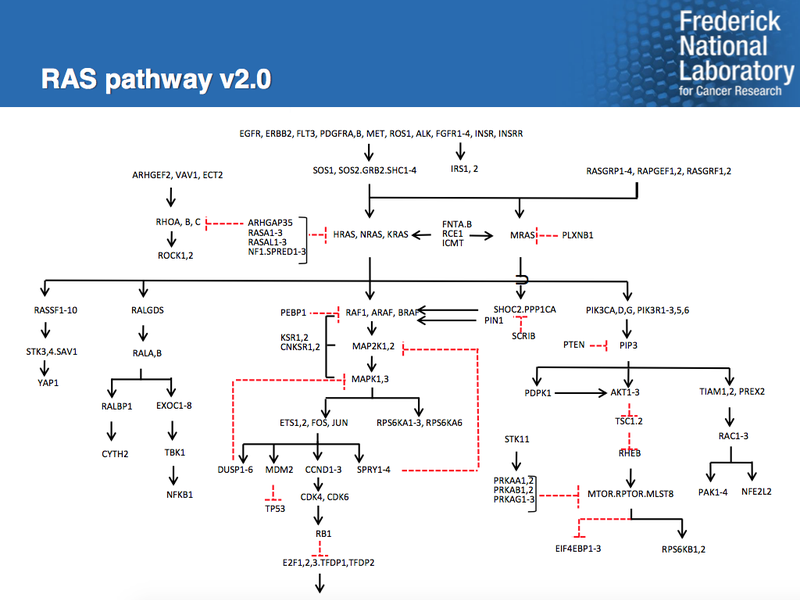 This collection contains 180 genes in the “RAS pathway version 2.0”, a crowdsourced pathway map of the RAS signaling pathway generated on the RASCentral website of the Frederick National Laboratory RAS Initiative. In each case, the primary splice variant was chosen to represent the most commonly found transcript by RNAseq data across all TCGA tumor samples. Many of these transcript variants are not available in cDNA or ORF libraries, or are available only in mutated forms. The sequences in this collection encode wild type proteins, and match the RefSeq data for the particular splice variants with the exception of known SNPs or cases in which the RefSeq data is not consistent with genome sequence data (see pathway map below).